1. Mainstream HR approaches have become generally accepted practice in many organisations and with that is an assumption of their inherent effectiveness - which evidence may or may not support. 2. 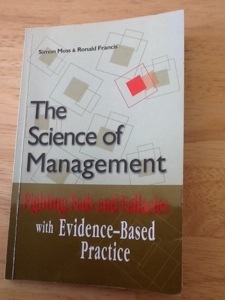 Some HR practitioners being unaware of what evidence-based HR is or how it can be used, i.e. what type of and standard of evidence constitutes valid and reliable evidence? 3. Lack of awareness of what relevant HR evidence exists and how to access and interpret it. 4. Most HR professionals work in very busy jobs - finding and interpreting relevant HR research may just be that type of desirable task that falls to the bottom of the pile as other more urgent (but not necessarily more important) tasks take up their time. 5. Difficulty translating academic research and writing style into tangible and practical HR practices. 6. In some instances, an inherent belief that academic research doesn't translate in the real world - or that the organisation for which you work is so unique that the research doesn't apply. 7. It can be very challenging when research or statistics presented provide evidence contrary to our own long held and espoused views of effective HR. 1. Review a sample of your company's current HR policies, processes and L&D/OD programs - is there a sound evidence base to support their use? If not, then prioritise and properly review and improve your practices. 2. Each time your HR Team commences developing a new HR/L&D program or practice, conduct a literature review on that topic so that there is a sound evidence base for options that are generated, and then use the evidence to sell the benefits and merits of the program as part of your change management approach. 3. HR professional bodies should play a greater role in identifying relevant new research and ensuring that its members are aware of it and and how to utilise the research in a practical way in the field. 4. Collect and analyse data to measure the effectiveness of your organisation's existing HR and L&D programs and practices. NB - This needs to go well beyond collating workshop "happy sheets", conducting an engagement survey and knowing your organisation's head count. Evidence comes in various forms: from academic research to analysis of an organisation's own data to experimental research within an organisation or industry. In order to provide the best possible outcomes for our organisations, HR needs to take a more deliberate and disciplined approach to utilising evidence in our every day work, just as is expected of other professions like engineering and finance. Now of course this doesn't mean that HR should become academics or robots who rely solely on research and data to make decisions. The best HR decisions will be made utilising evidence as one of a number of critical components of decision-making, including your understanding of the organisation's context, your experience and using intuition. What is your experience with evidence-based HR? How have you seen it used to improve organisation outcomes? Or is it just an academic concept that's too impractical for complex modern workplaces?